The object of the training course is to give the installer a complete knowledge of the Cintec™ anchoring system. During the course the Cintec™ anchoring system is demonstrated, and the installers given hands on experience as to the techniques of installation. Upon completion of the course, successful trainee’s are certificated and issued with an identity card. The company is then entered onto the Cintec™ approved installers list. 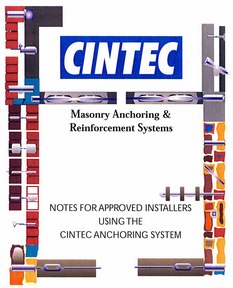 The certification procedure and its accompanying training manual provide a basic guide to the installation of the Cintec™ anchoring system. Whilst it provides a firm basis for its use, it cannot comprehensively cover all possible applications. Additional information and training is available from Cintec™ International subject to prior arrangement. The requirements of the Health and Safety Act are drawn to the attention of trainee installers, particularly with regards to the use of the grout and equipment. The use of diamond core and rotary percussive drills is presented. More detailed instructions are given in the manual about diamond core drills in hand held applications. Grout and grout mixing are presented. This stage is the most important in the application of the Cintec™ anchoring system. The grout has been carefully designed and if mixed in clean equipment and according to specified procedure, successful grouting can be routine. Site and equipment cleanliness are fundamental to safety and successful installation. Successful grout injection relies on good treatment of both anchors and grout from the moment of their arrival on site. Emphasis is placed on their careful storage and handling. The operation of the grout pressure pot is detailed in the manual along with graphical illustrations. Emphasis is placed on the requirement for cleanliness for all aspects of the mixing and grouting. Graphical illustrations are given of the steps in the grouting procedure, together with details of the customary range of injection pressures. The two-stage mixing of the grout is detailed carefully. The specified procedure leads to a grout which is easily and successfully injected. Details are given to enable the installer to monitor the mixing procedure and subsequent injection to ensure the grout injection is successful. Details for hot and cold weather grouting are given. Anchor injection is specifically illustrated, since this provides visual and tactile evidence of successful anchor installation. Attention is drawn to the visible excess milk grout which should be present at the front of the sock and the front of the anchor should be firm to the touch and not move in any direction. The excess grout milk is washed off immediately. An installer is required to carry his identification card on site whilst undertaking all work requiring the use of the Cintec™ anchoring system. The card must be available upon request to all authorized site and Cintec™ International personnel. Cintec™ carries the responsibility for the product whilst the installer has the responsibility to carry out the work in a professional manner.